One of many designers at The Southbank's Festival of the World is Bee Man, not Beaman - Marc Cowan. He is the Bee Man because he likes bees. Well... partially. Not fully. He is the Bee Man bee cause he is involved in the days top story, told by someone else about a bee. The story was related by the Queen Bee. It involved Marc the Bee Man. Once upon a time we all beecame very small and found ourselves stretched out, feeding, cocoon like in a hive. Queen Bee June, the Queen of mid summer, was throwing a party to celebrate a festival and she was telling everbody about the worker bees especially Bee Man Marc Cowan for it was Marc who built this little vast world in which we were regaled. Marc the Bee Man built the floor. Outside the space he found a bee. A BIG BEE! A BIG DEAD BEE!!. He bought the BIG DEAD BEE!!! into the hive and he covered it in resin to protect it and to stop it having no meaning other than the meaning that he had given it or at least the meaning that Queen Bee June misrepresented beecause Queen Bee, whose word must bee trusted beenignly gave the impression that the BIG DEAD BEE!!! was now buried in the floor of the space that we call the hive. What was it doing there? What do you think it was doing there? I don't know but I do know this. I was curious. I wanted to get myself into a busy bee tizzy of activity and go home and find a spade and come back to the hive and dig up the floor and find that BIG DEAD BEE!!! and find out for myself what it was doing there. What had happened to it. Now this is typical me. I am big, blustery, breaker of balls (sorry - walls) and floors and typically I had no concern as to the state of the space and how we would all be ok to stay there and bee regaled again. So it was that everyone got frightfully buzzy busy and flapped and fussed and i found myself outside smelling the flowers, passing messages to my friends about who i was and what i was doing and how i would find that BIG DEAD BEE!!! and as i passed around doing my bee dance of communication to Ms A and Ms B, not bee. I eventually found Mr C himself. Marc Cowan is a freelance designer. He is a very nice man. He had been working as a volunteer at the South Bank, helping to create a space, the Festival Village, a hive in the centre of the Festival of the World. 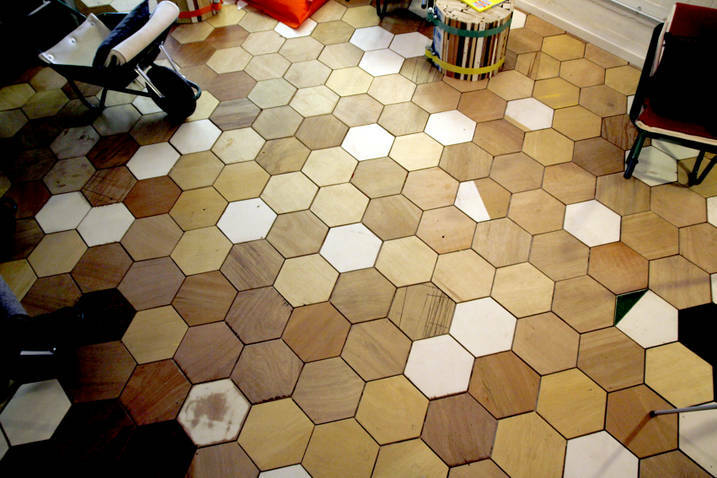 He quickly worked his way up the workers queue and he was given a job to do, for he was an enthusiast and he had an idea and the idea was to create a floor and the one thing no one wanted him to do because it would bee too big and bee too long and bee too expensive was to build a floor. So what did Marc say he wanted to do? He said he wanted to build a floor. And just beecause everyone said don't build a floor Marc for all the reasons already given, which no one now wanted to say again it was agreed that all the workers could get together around Marc and build a floor. Wood was salvaged, matting was recycled, some money was spent on things just so Marc could realise an idea in a public space and that's a wonderful thing. But, something people don't realise about the South Bank, its not something that you would necessarily know, is they have a commitment to using space, creating environments, sustaining and developing life and a life force they are very proud of is the fact of their own lovely bees of which they are very proud. Marc was outside the space one day and he found a bee. Have you ever seen the first bee of spring? It is a very BIG BEE!! VERY HEAVY BEE!!! flies close to the ground type of bee, seeking out the smallest flowers, the flowers that have hardly grown type of flowers. Those ones. You know them, The crocuses, the snow drops, the small before the daffodils ones. And Marc thought what can I do with this BIG DEAD BEE!!! to show my love for it, my pride in it, my empathy with its struggles in this time of bad climate. I'll preserve it. I'll put it in my floor. I'll put it where people can find it; if only they know it is there, or are open to the fact that it can be found. Well I like Marc Cowan and I liked his story and I liked his story even better than the Queen's Story but I was still curious. Curious and quite glad that I didn't have to go all the way home and pick up a spade and go all the way back to the hive of the Festival Village and knock down all the walls and dig up all the floors to find the bee. But I was still curious enough to go back when I shouldn't have gone back and walk in and not be challenged for walking in and scouring the floor in a nose low to the ground type of way to find - not a bee covered in resin - but a cast, an impression of a BIG DEAD BEE!!! and I loved the fact of this story that I could just go and do that, and hear that, and write that, and tell you, dear readers. Thank you Marc the Bee Man and Queen Bee June, Queen of Mid Summer, Artistic Director of the South Bank for without you and your Festival of the World this story would never have happened.